NeuWave Medical, a Madison, WI-based maker of medical devices that use microwave energy to zap tumors, has received FDA clearance to sell new software that it says can help doctors more easily monitor each step of the procedure, and more confidently determine that the cancerous tissue was eradicated. NeuWave’s products deliver focused heat to “ablate,” or destroy, tumors, primarily those located in the lungs, liver, kidneys, or bones. One or more thin antennas are inserted into the targeted soft-tissue lesions, and they discharge microwave energy from the tip, causing the tumor’s water molecules to heat in a way that eliminates the tumor, while avoiding damage to nearby healthy tissue, NeuWave says. Tumor ablation procedures have become more popular over the past few decades, in part due to advances in minimally invasive surgery—which only requires a small incision—and imaging technology that can help guide the ablation. But the way images are currently used to monitor these procedures is a bit clunky, according to NeuWave. In most situations, a computed tomography (CT) scan would be taken before the procedure to get a picture of the tumor. Next, the doctor would place the antenna into the tumor and take another CT image to confirm the probe was placed correctly in the target area. After performing the ablation, another CT scan would help determine if the tumor had been completely burned away. The problem, NeuWave says, is that those images are often viewed on separate screens, sometimes located outside the operating room. Doctors “do quite a bit of walking back and forth,” NeuWave CEO Dan Sullivan says. More importantly, “comparing pre- and post-ablation CT scans is cumbersome and requires the user to ‘imagine’ what the scans would look like if they were overlaid to determine whether or not the lesion has been ablated,” he says. NeuWave’s new software, which it calls Ablation Confirmation, can perform that task for the doctor. The software imports and processes images from CT scanners, seamlessly combining them and churning out 2D and 3D images that can be viewed by the doctor on a monitor in the operating room. The software can be used to better identify tumors, check that the antenna has been properly inserted into the tumor, and confirm the entire tumor has been zapped—all without leaving the room or having to “break scrub,” NeuWave says. The software, for example, can take the pre-procedure image of the tumor and lay on top the post-operative image of the burn zone. The software analyzes the two images and indicates whether or not the whole tumor has been zapped. If the mass representing the tumor shows up green, the software has determined that the target has been fully eradicated; if any part of it is red, that means there appears to be remnants of the cancerous tissue. In that case, the doctor can then administer another round of microwave energy while the patient is still in the operating room. In this sample screenshot shared by NeuWave, the target tumor is colored green to indicate that the procedure appears to have successfully burned the whole tumor. If there were any remnants detected, they would appear red. The 3D color-coded images are an upgrade from conventional 2D CT scans that use shades of gray, says Angela Gillespie, NeuWave’s vice president of marketing. “It’s difficult to see where the tumor is and where the probe is in relation to the tumor,” she says of regular CT scans. The new software gives the doctor “knowledge and confidence” that he or she “got all of the tumor,” Sullivan says. And the software could make the procedures more efficient. “It does have the potential to save quite a bit of time,” he says. The software might also help prevent additional operations due to the doctor missing some of the tumor and not discovering that until a follow-up visit, he adds. Similar imaging and guidance software is already available for other medical procedures, such as implanting stents, says Sean Tutton, a medical doctor; a Medical College of Wisconsin professor of radiology, surgery, and palliative medicine; and the chief of its vascular and interventional radiology division. 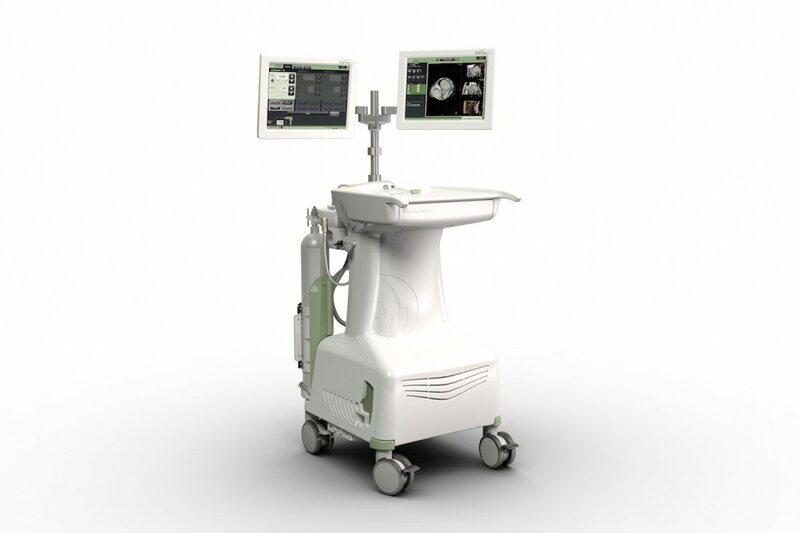 But NeuWave’s product is the first FDA-approved software that can perform such tasks in real time as part of microwave ablation procedures, Tutton says. It’s “something that we’ve been waiting for for some time,” he adds. Tutton has used NeuWave’s ablation system for two years to treat liver and lung tumors. In May, he and some colleagues got to test the Ablation Confirmation software on a non-living model. “We were very excited by it and looking forward to the approval,” he says, adding that NeuWave has not paid him any consulting fees.